Do you love homemade pinto beans? 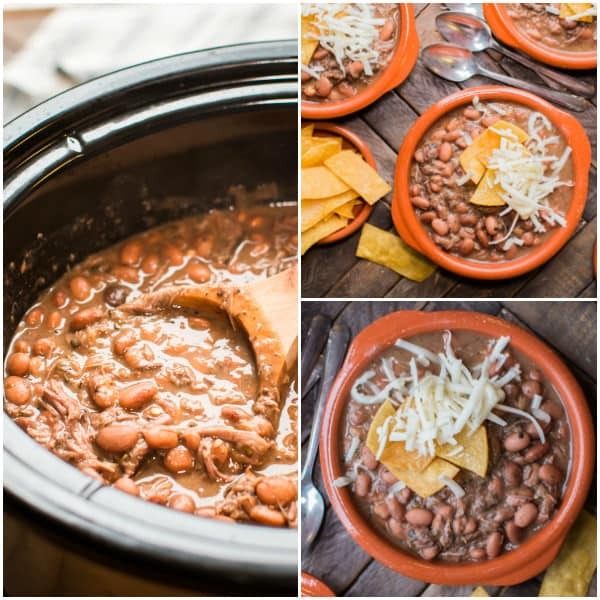 Then you will LOVE this Slow Cooker Pinto Beans and Beef. Hello! 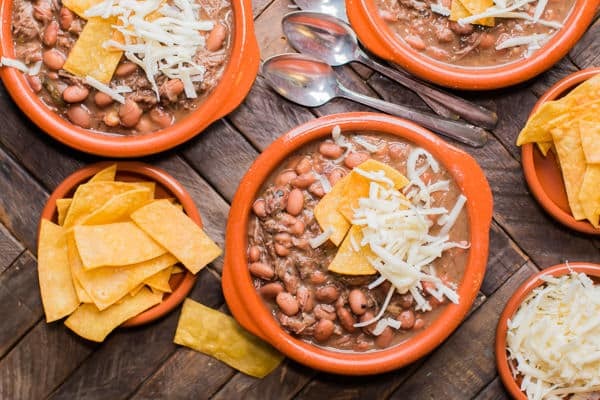 This Slow Cooker Pinto Beans and Beef recipe will not disappoint. I did not go the chili route when seasoning this, I did a mild seasoning just to bring out the flavor of the beans and beef. I love homemade pinto beans, especially if they are creamy. When cooking pinto beans on the stove-top they end up being creamy, because of the stirring that the stove-top beans require. 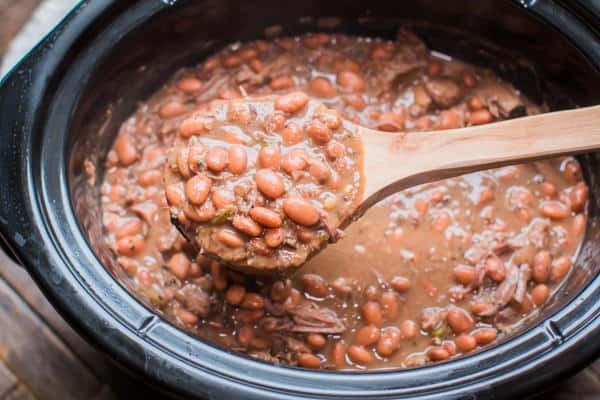 To get this creamy effect in the slow cooker I take out a cup or more of beans after they are done cooking and put them in a bowl, I mash them up, them stir them back into the rest of the beans, problem solved! If you plan on making these beans be sure to read that the pinto beans need to be soaked overnight, doing this will help the beans get nice and tender during the cooking the next day. 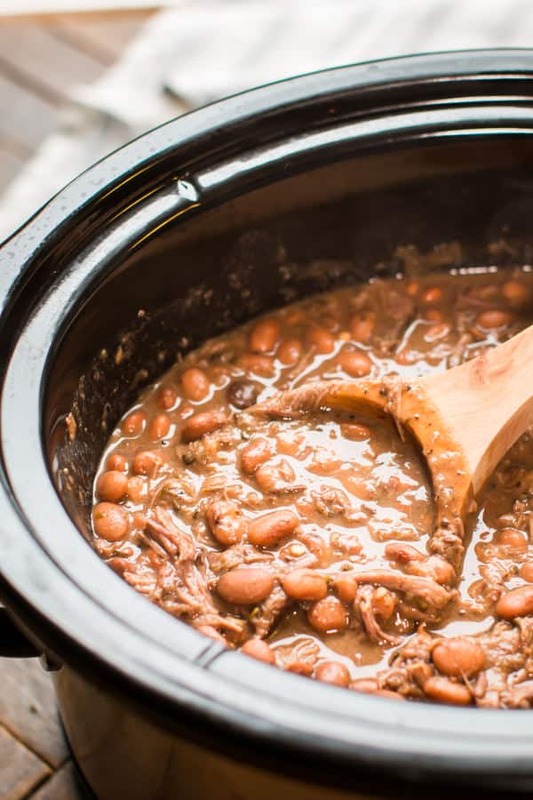 If you forget to soak, it would be best to do a quick soak method before adding the beans to the slow cooker, you can see how to do that here. This meal doesn’t need much for serving after it’s done cooking. Just tortilla chips and Monterey Jack cheese was a great match for our tastes. My mom and grandma can make the best pot of pinto beans on the stove, me not so much. When I cook pinto beans on the stove I seem to forget about them and they burn. The slow cooker is the way to go for me when cooking beans. 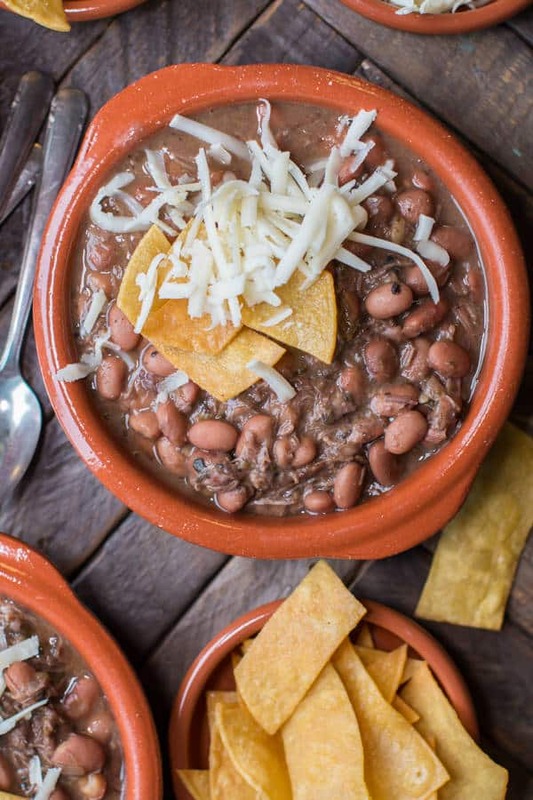 If you cook with beans often I suggest you look into Rancho Gordo Beans, I ordered a large shipment of unique beans and can’t wait to make more recipes like this one. I plan to make a cassoulet soon, I’ll let you know how it turns out. I hope you enjoy this recipe! I will be back next week with more recipes. Have a good weekend! The night before you are ready to cook this, add the pinto beans to the slow cooker. Cover with a few inches of water. Do not turn on the slow cooker, let the beans soak overnight in the water. In the morning drain the water off the pinto beans. In a large skillet set over medium-high heat, add a small amount of cooking oil. When the oil is hot, brown the chuck roast on all sides. Set aside for a moment while you add the other ingredients. Add the beef bouillon cubes, poblano pepper, onion, garlic, bay leaves, pepper, oregano, cumin and cayenne pepper. Pour over the water and beer, stir. Add in the browned beef. When the cooking time is up, remove the bay leaves and discard. Remove the chuck roast, shred and discard fat. Set aside for a moment. Degrease the pinto beans by laying paper towels over the top of the beans, and pull up quickly. Discard the paper towels. Take about 1 cup of the beans and some broth out into a small bowl, using a fork or a potato masher, mash up those beans, add them back into the slow cooker with the rest of the beans. Add the shredded meat back in. Stir. Serve with tortilla chips and shredded Monterey Jack cheese. 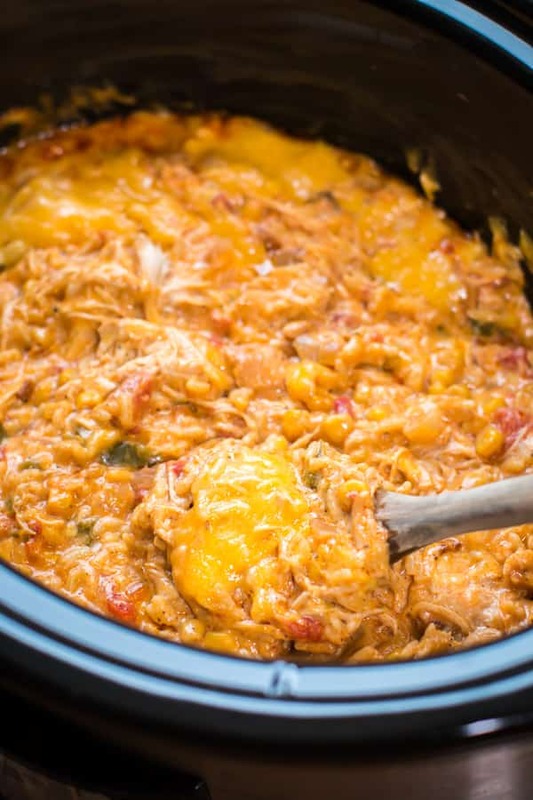 I used my 6-quart oval Crock-pot® for this recipe. 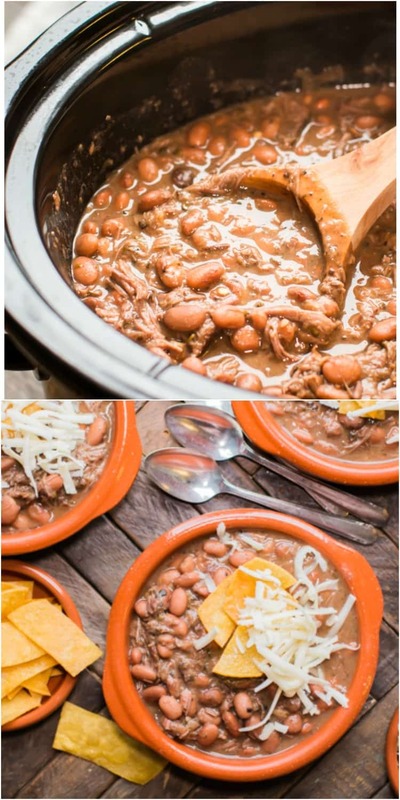 This Pinto Beans and Beef soup sounds and look delish. Have to try. Funny, but all these decades and it never ever occurred to me to use beef (Mama always used ham). Love anything beef. Bet a couple of slices of hot buttered fried cornbread would complete it! oh yes, corn bread would be great with this! How many carbs ? My 8 yr. old daughter is type 1 diabetic, i must compensate the catbs for insulin.. Even if you don’t add the meat — this is the best recipe for beans! The flavor is amazing. I’ve done these beans with venison, with a ham hock or just plain beans. This is the recipe I will be using from now on! I always get compliments on how great they are. Thank you for such a great recipe! So happy you like it Jacque. I will have to try with other meats.